Slow cookers, or crock pots, are a fantastic addition to your kitchen. They help save time and money, and make it simple to get a delicious dinner on the table after a busy day. Want to learn more? Click here to find out the many Benefits of a Slow Cooker. I’ve recently been trying out this 5.7 litre slow cooker from Crock Pot. Did you know that Crock Pot made the original electric slow cooker back in 1970? Since then, they’ve kept up to date with the latest styles and tastes in slow cooking, and their range of products reflects this. They have a range of slow cookers to suit every size of family, and they all deliver great tasting food without you needing to spend hours in the kitchen. This particular model is a generous 5.7 litre slow cooker, which will easily feed six hungry people. There are three settings – low, high and a warm setting for keeping food warm when it’s finished cooking. And it has a hinged lid, which solves that annoying problem of where to put the lid down while you’re adding ingredients later on in the cooking process. The lid can be removed for easy cleaning – you’ll be glad to hear that both the lid and stoneware are dishwasher safe. And the stoneware pot can even be used in the oven as well. 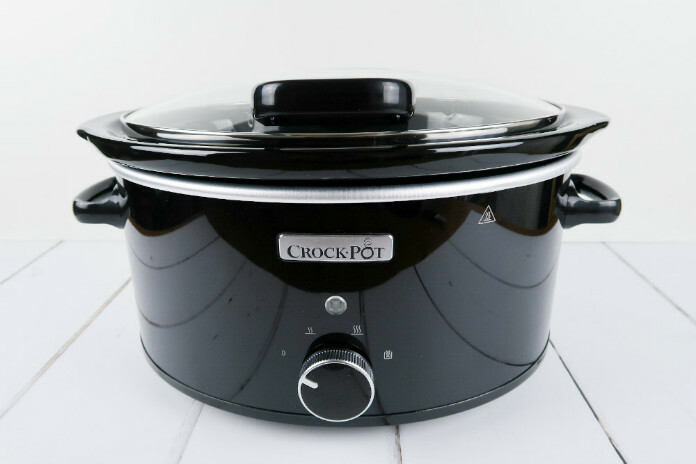 This Crock-Pot is a high quality piece of kitchen equipment from a company who know more about slow cooking than pretty much anyone! Make sure you get the right size of slow cooker to suit your needs. Slow cookers come in a range of sizes so you need to be sure that you’re using the right one for the recipe you’re cooking. A 3.5 litre slow cooker will generally fit 4-6 portions. A 5.7 litre slow cooker will feed at least six, which is great if you want to batch cook for the freezer or regularly feed a crowd. Check out the features on the slow cooker you’re planning to buy. The Crock-Pot that I’ve been testing has a handy hinged lid, and others have digital timers or a switch that will switch setting when the food has finished cooking. Care for your slow cooker. The ceramic or stoneware pot may crack if it’s exposed to sudden changes in temperature. So let it come to room temperature before you turn it on, and don’t place a hot stoneware directly onto a cold kitchen top. Don’t use frozen food. It may be tempting to pre-freeze ingredients for slow cooker meals and just add them to the slow cooker straight from the freezer. But this is a definite no-no as it can lead to food poisoning. Make sure that your food is all fully thawed before you turn the slow cooker on. Choose the right cuts of meat. There’s no point cooking expensive lean cuts of meat as they tend to dry out. Tougher joints like pork shoulder, lamb shanks and short ribs are ideal for the low slow heat of a Crock-Pot. But on the other hand, slow cooking is great for venison and brisket, and really helps to tenderise them. You can use less meat in a slow cooker. The slow cooking process helps to bring out the flavour of the meat, so you can get away with using less. Bulk up stews and pot roasts with vegetables instead. Trim away excess fat. You need to remove any excess fat from meat to avoid ending up with a greasy, oily sauce. If you are cooking chicken joints, it’s a good idea to remove the skin from the chicken as well. Brown your meat to add flavour. If you’re short of time, then feel free to skip this step – you’ll still end up with a delicious meal. But if you take a few minutes to brown meat and quickly saute your vegetables, the flavour will definitely be improved. Don’t leave any flavour behind. All those caramelized bits on the bottom of the frying pan are packed with rich flavour. Deglaze your frying pan with a little wine, stock or even water, and add them to your slow cooker for even more tastiness. Watch how much wine you add into the slow cooker. The alcohol won’t evaporate away as it would when you’re cooking on the hob or in the oven. This means you can add less for the same boost in flavour. Get ready the evening before. cut meat and vegetables into even sized pieces, and trim any excess fat from the meat. Measure out any other ingredients and liquids. Store each component in separate containers in the fridge. Finish it off in the morning. Add the ingredients to your slow cooker, browning them first if you want to (and have time). If your slow cooker doesn’t have an automatic switch, make sure that you’ll be home fairly close to the end of the cooking time. A tip for when you’re really short on time. Prepare all of the meat, veg and dry ingredients and add to the slow cooker insert. Cover and store in the fridge overnight, then you just need to add liquids in the morning. Make sure that you will have time to bring the stoneware up to room temperature before switching the cooker on! Add ingredients in the right order. Make sure you cut your ingredients into even-sized pieces so that they all cook at the same rate. Harder vegetables like potatoes and carrots should go at the base of the stoneware, closer to the heat sauce, and they need to be covered by liquid. Avoid overcrowding your slow cooker. Generally you want to avoid filling your slow cooker above two-thirds full, check your manual for specific instructions. You also need to be sure that the lid fits snugly on top. So if you know that you will want to cook big roasting joints, make sure you go for a larger slow cooker. Don’t add too much liquid. The liquid won’t evaporate like it does when you cook on the hob or in the oven. So make sure that you don’t add too much liquid to your slow cooker. The liquid should just cover the meat and vegetables. If you overfill it, the liquid will overflow out of the top and your food won’t cook as well. Tips for thickening your sauces. The liquid in a slow cooker doesn’t thicken, so you need to use a couple of tricks for a rich, thick sauce. You can roll your meat in a small amount of seasoned flour, before adding it to the slow cooker. This works particularly well if you are browning your meat first. If you aren’t browning the meat, then mix a couple of teaspoons of flour with a little cold water to form a slurry. Stir this into the slow cooker about 30 minutes before the end of the cooking time and replace the lid. Choose the right heat level. Generally a recipe will take twice as long to cook on high as it will take to cook on low. So make sure you pick the right heat setting for your requirements. Use Low heat if possible. Unless you need a recipe to be cooked in a shorter length of time, try to use the Low setting wherever possible. Most dishes will benefit from the slower, more gentle cooking. It also means that you can leave your dinner to cook all day, which can be really convenient. It’s possible to convert standard recipes for use in a slow cooker or Crock-Pot. You will need to reduce the amount of liquid, and alter the cooking times. Don’t lift the lid! Every time you open the lid of the slow cooker, you will add around 15-20 minutes to the cooking time. This is because it takes that long for the contents to go back to the cooking temperatures. And don’t stir it either! It’s not usually necessary and just cools the food down even further. Only open the slow cooker around 30 minutes before the end of the cooking time, to check if it’s done. Add dairy at the end. Dairy products like sour cream, milk and yogurt can tend to break down in the slow cooking process. So only add them in for the last 15 minutes of the cooking time. Finish with a fresh touch. Add chopped herbs, a squeeze of lemon juice or a sprinkle of grated cheese to brighten the appearance and flavour of your dish. It will also help to cut through the richness of slow cooked sauces. One final safety note. If you find that you’ve left your filled slow cooker unplugged for hours, or have accidentally selected ‘warm’ instead of one of the cooking temperatures, I’m afraid your food is unusable. To avoid the risk of food poisoning, throw it away and start again. Crock-Pot are the makers of the original slow cooker, and they’ve kindly offered to send a fantastic Crock-Pot to one lucky SallyAkins.com reader. As always, it’s really easy to enter my giveaway. Just log into the Rafflecopter below, and answer the simple question to be in with a chance of winning this fab prize. If you’d like to boost your chances of winning, there are optional social media entries as well. The giveaway is open to UK entrants over 18 only, and will close at 11.59PM on 13th December 2017. And the question you need to answer is: What recipe would you like to try out in the Crock-Pot first? I’d like to try a winter stew in the Crock Pot! I would make a sausage casserole! A beef & marmite casserole! A chicken curry would be lovely! A crock-pot minestrone would be delicious!! I’d try out a butter bean stew, it needs long slow coking so would suit this perfectly. Wouldn’t be thickening it with a flower though! A nice rich beef and guinness casserole. Probably a lovely stew and dumplings. I would do a ham joint for christmas. I’d definitely have to make a sausage casserole first! Beef Stew with chunky veg and dumplings. A big leg of lamb with mint gravy! I’d like to try a vegetable stew. I love authentic Mexican food and would love to make so slow cooked Mexican brisket. I would love to try a beef stew to see how tender the meat is when it is slow cooked. A nice Portuguese stew. Specifically the one my mother taught me how to make. Sweet and sour chicken. I remember my aunt doing this in her slow cooker and it was really good. I would do Goulash – it would be brilliant done in a slow cooker. I think it would have to be a nice beef hot pot. A warming and comforting chilli con carne… it’s a favourite. I’d slow cook a full chicken first, I love how tender it comes out. I’d try a rice pudding. In this perishing weather I would like to make a lovely beef casserole with onions and carrots. I’d make my delicious veggie 3 bean chilli. Beef casserole, a good winter warmer. Veggie stew and dumplings. It’s one of my families favourite meals and requires little effort for me with the slow cooker! I would try out a Winter veg casserole recipe. My friend made me some amazing slow cooked pulled pork, and I would love to be able to try to replicate it! \i’d like to try boeuf bourginon. I’ve never made it before. A lovely melt in the mouth pot roast beef! I’ve seen that you can do a Lasagne in a slow cooker so I would love to give that a try. I’d like to have a crack at a chicken curry as I’ve never made one before. Oooo, i’d so love to make Beef hotpot, it would be so fab to come home to a hot meal that’s been cooking slowly & not having to rush around preparing meals when i get home from work. It has been so cold this week I think I would make a hearty chicken and dumpling stew. Would probably be a hot chilli con carne! I love a slow cooked beef casserole with seasonal vegetables. Vegan stew and dumplings at this time of the year. Must admit the VEGETABLE LASAGNE intrigues me. Love vegetable lasagne but not sure how it would work in a slow cooker. Dying to try it though. Moroccan chicken with butternut squash sweet potatoes and chick peas. Beef stew and dumplings – yum! !